Curry and Rice $7 for about 50 minutes work. Garlic - 3 cloves Green Chili Pepper Salt - 1 tsp. 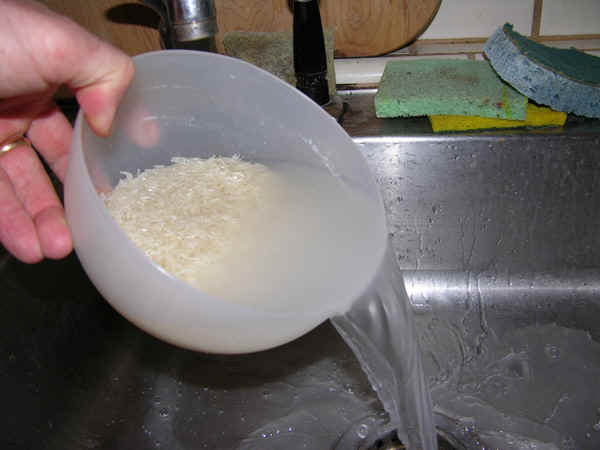 Wash the rice to remove loose starch. Put 1.5 cups of jasmine or basmati rice in a large bowl. Fill the bowl with water, stir and pour off rinse water. Repeat at least 3 times. Drain all rinse water, then add a little less than 3 cups of water and 1 tsp of salt. I heat the rice in my microwave oven until it boils (7 to 10 minutes, watch so it does not boil over); let it sit covered 5 minutes and zap it another 30 seconds; then, it should be ready to eat in another 10 minutes. Heat oil (it can be corn oil, if you don't have sesame) in pot. Add chopped onion, garlic and spices. The green pepper (e.g., Serrano, Jalapeno) can be added whole (less hot), cut with seeds removed (medium hot), or cut with seeds (hot). I sauté for a few minutes, without browning too much. Add bite-sized diced potatoes and drained garbanzo beans, then sauté for a few more minutes. Add the can of coconut milk and a couple cups of water. Simmer, stirring occasionally until the potatoes are about cooked (about 15 more minutes). With 5 minutes of cooking left, add the green vegetables. 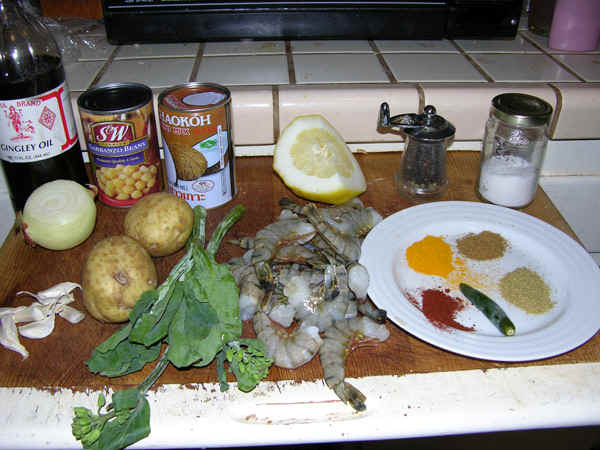 At the last minute, add the shrimp. Salt and add lemon juice to taste. 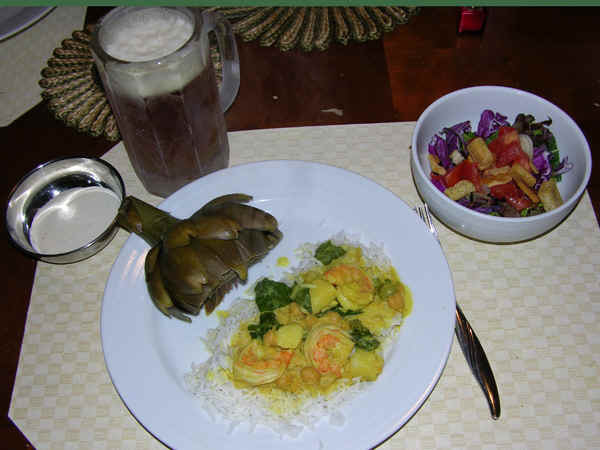 Serve the curry over the rice. - Coconut milk is a must. 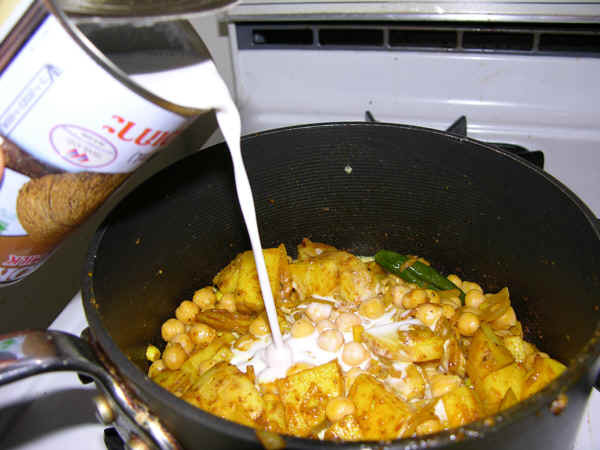 A thicker sauce can be obtained with more coconut milk and less water. 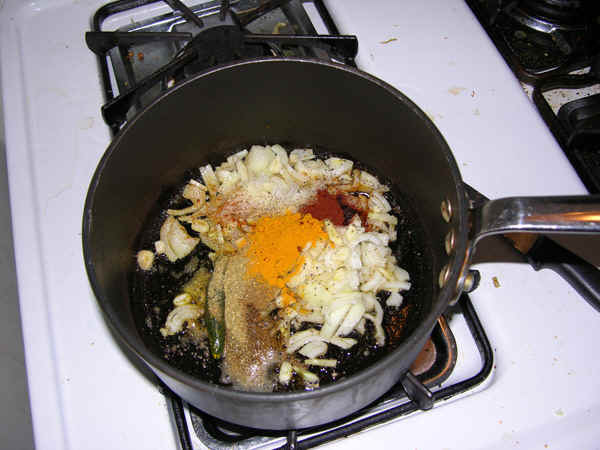 - "Curry Powder" can be substituted for the listed spices. However, I prefer to grind my own spices separately in my spare coffee grinder. - For shrimp, I like large deveined tiger shrimp. 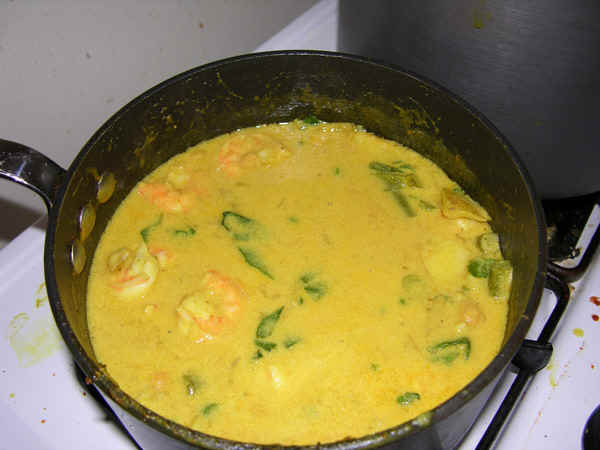 - Chicken can replace the shrimp of a nice chicken curry. Creative people often have unique ideas that require patent, trade secret, copyright or trademark protection. Contact me at BioPatent for a free half hour consultation. Please see my background and low rates.